Time magazine’s photo blog has a very interesting picture where Barack Obama is displaying the things he carries in his pocket to bring him luck. One of them is a tiny metal statue of the Hindu god Hanuman. 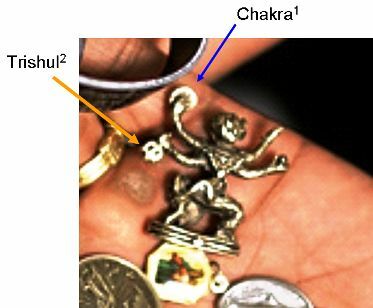 What caught my eye that tiny icon (or Murti) did not look like one of god Hanuman as it has 4 hands, one holding a chakra, the other a trishul or a gada, the other two hands have a lotus and a conch, presumably. These 4 things are associated with Lord Vishnu (Lord Krishna is an incarnation of Lord Vishnu). However, the tiny statue has a tail (it also looks like that while showing this to the reporters, the face of the statue was touching the palm). Sending this image to a professor at Delhi University for further analysis. Here is the slightly annotated version of the original picture.